But there's more to so-called "Unit Time" than just meetings and me doodling in my notes. There's also team-building activities! Question: You know what I love about team-builders? Answer: The fact that I've already done them all multiple times before! Facilitator: "Okay, now we're going to split up into groups and do group charades. Your group will have to act out some sort of machine and everyone else will have to guess what it is." Me: "I hope we're not a washer and dryer. They always do washers and dryers for this thing." Teammate: "We're a photocopy machine." Me: "Good. It's not a washer and dryer." A team goes up. One person stands betwixt two other people. They try to get set up. Me: "A washer and dryer!" The team stares at me, incredulous. They finish their charade, disheartened. Me: "Hehe. Every single time..."
Facilitator: "Okay, now we need you all to line up without speaking. And you're going to line up by....shoe size!" Me: Moves his size-13 feet to the far end of the line and stays there. Facilitator: "Okay, now we're going to line up again. This time, some people can speak but will be blindfolded, others have to plug their ears and hum...[edited for time]...and everyone else will just not be able to talk. Now, we need to line up by....birthday!" Me: Takes out cell phone and types "June 5" into a text message box. Finds place immediately. Facilitator: "Okay, now we're going to pair you up, and you have to sit back-to-back. One person will have a piece of paper and marker. The other will have to instruct them how do draw a picture we showed them earlier. But they can't say what the picture is of! The drawer can only ask clarifying questions. Okay, go!" Co-Worker 1: "Okay, first, on the left half of the paper, close to the center, draw a square with sides that are about the length of your pinky." 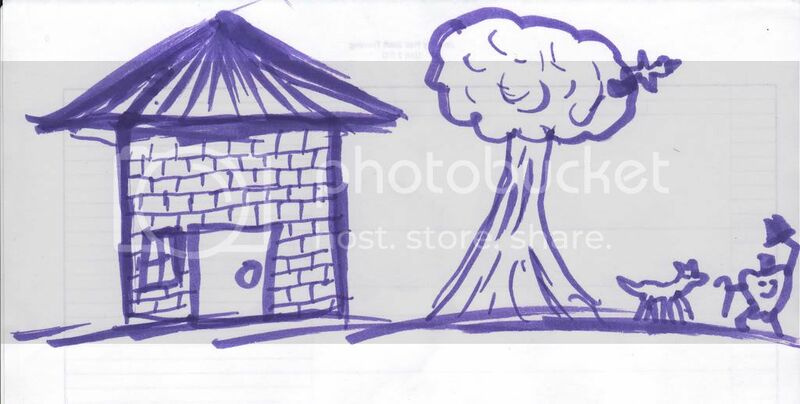 Me: "Clarification: Am I drawing a house with a tree next to it?" Me: "Gotcha." Draws the following picture. Facilitator: "Okay, now you all [24 people] have to get into this tiny square on the floor." Co-Worker 2: "Wait, they never said we had to put our whole body into it! Let's just put in our fingers!" Me: Puts in ten fingers and begins doing push ups. Co-Worker 3: "[Facilitator], Andrew's showing off. I think that's a sign that the team builder is over." Me: "Hell yeah it is!" Ah, team builder exercises. I feel bad for the newbies who think it brand new and that they're going to be part of the team. What of the nOObs that want to be the stars of the team but merely fade away. Ah, good old veteran status, how much do I love thee? 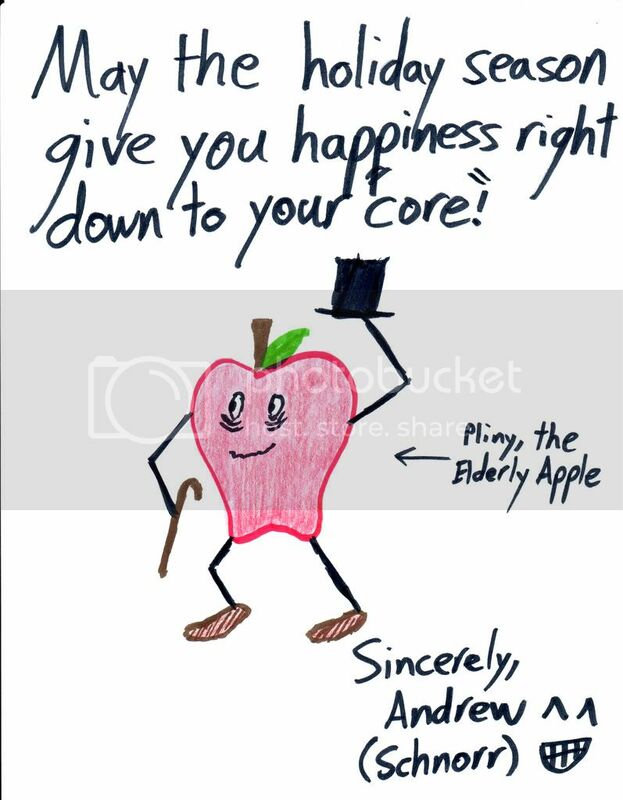 A Google search for Pliny, the Eldery Apple places you as #1 of about 7,860. 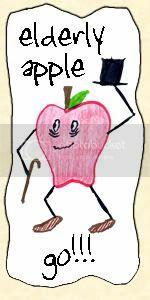 Congrats, you have dominated the historical geriatric apple club. They never change them! They had me doing those way back when I first started on staff. Same game. Same machines. The house and tree picture made me LOL, thankfully my students finished their final and left before then!